It appears that Socref is a pronuker who is about up to my level of sophistication. There is a good chance he is paid troll, but may just be a true believer. He is casting uncertainty and doubt, he tries to proclaim that the blow up mode is simply a statement of a mathematical singularity in which the equation blows up, like trying to divide by zero. But the blow up mode means far more, and in fact, this issue is the line in the sand for the pro-nukers. To keep the industry going, they have to pretend they have a solution to the pollution problem. Their solution has been MOX, plutonium enriched fuel. All fuels can blow sky high in an uncontrolled reaction called a Moderated Prompt Criticality (MPC). Uranium fuel needs just the right conditions. But MOX fuel is 10 times more likely to enter the MPC and with 20 times the explosive result, all due to the plutonium being more likely to release neutrons more easily and more quickly. So their "holy grail" has been shown to be a Holy Curse, as both Reactor 3 and the Equipment pool of Reactor 4 both had MOX and both blew and had extreme fires. And now we have a poisoned Pacific Ocean. MOX blows up in a Nuclear Criticality, Upward as in "Radiation Cannon", Hydrogen Explosions are a volume explosion, also pushing down and out. This picture should make it clear, the whole video is on the links below. Here is what a Radiation Cannon looks like, just add Plutonium laced MOX fuel. The proof is not just in posts at Nuke Pro, but these are permanent pages, see the tabs at the top. And when you see that probably at least 100,000 lbs of Uranium and Plutonium was aerosolized into the atmosphere, you know for sure that it wasn't just a hydrogen explosion which blows from the top down and blows out the walls. It was a "Radiation Cannon" with the explosive force coming from below and within the mixture of fuel, causing it to be launched up and out. Remember the videos of Reactor 3, and when Reactor 4 also blew and had a big fire and side meltout, they covered up the video of Reactor 4. They were loading MOX Plutonium into Reactor 4, and MOX Plutonium was stored in the Equipment pool (opposite from the spent fuel pool). 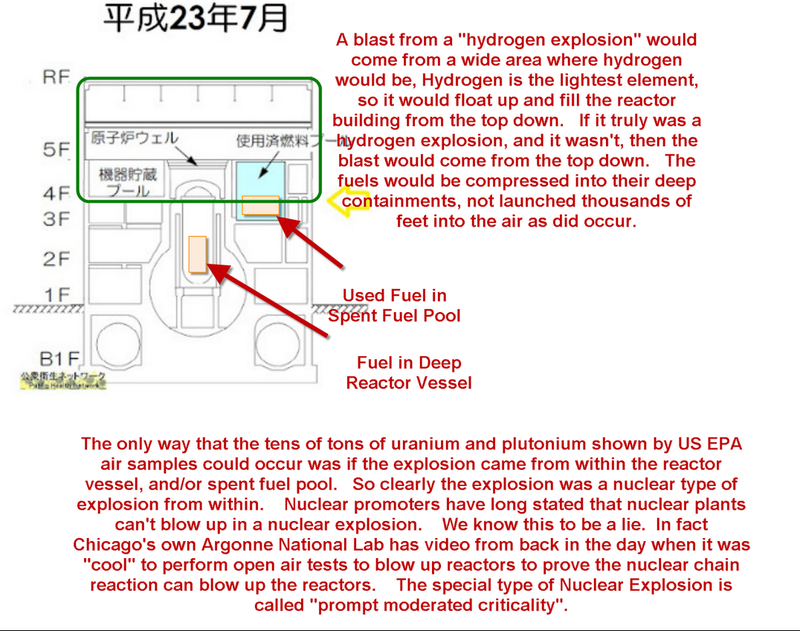 MORE BACKGROUND FROM ANOTHER SITE “…….Mystery of MOX super-fuel A Mainichi Shimbun editorial mentions in passing that the Reactor 4 pool contains 202 fresh fuel assemblies. Why were new rods being stored inside a spent-fuel pool, which is designed to hold expended rods? What threat of criticality do these fresh rods pose if the steel frame collapses or if crane operators drop one by accident onto other assemblies, as opposed to a spent rod? Against the official silence and disinformation, a few whistleblowers have come forward with clues to answer these questions. Former GE nuclear worker Kei Sugaoka disclosed in a video interview that a joint team from Hitachi and General Electric was inside Reactor 4 at the time of the March 11, 2011 earthquake. By that fateful afternoon, the GE contractors were finishing the job of installing a new shroud, the heat-resistant metal shield lining the reactor interior. (4) TEPCO inadvertently admitted to the presence of foreign contractors at Fukushima No.1 up until March 12, 2012, when the management ordered their evacuation in event of a massive explosion during the rapid meltdown of Reactor 2. So far, leaks indicate the presence of the GE team and of a Israeli nuclear security team with Magna BSP, a company based in Dimona. (5) Another break came in April 2012, when a Japanese humor magazine published a brief interview of a Fukushima worker who disclosed that radioactive pieces of a broken shroud were left inside a device-storage pool at rooftop level behind the Reactor 4 spent-fuel pool. (6) This undoubtedly is the used shroud removed by the GE-H workers in February-March 2011. A curious point here is that the previous shroud had been in use for only 15 months. Why would TEPCO and the Japanese government expend an enormous sum on a new lining when the existing one was still good for many years of service? Obviously, the installation of a new shroud was not a mere replacement of a worn predecessor. It was an upgrade. The refit of Reactor 4 was, therefore, similar to the 2010 conversion of Reactor 3 to pluthermal or MOX fuel. The same model of GE Mark 1 reactor was being revamped to burn MOX fuel (mixed oxide of uranium and plutonium). The un-irradiated rods inside the Unit 4 spent-fuel pool are, in all probability, made of a new type of MOX fuel containing highly enriched plutonium. 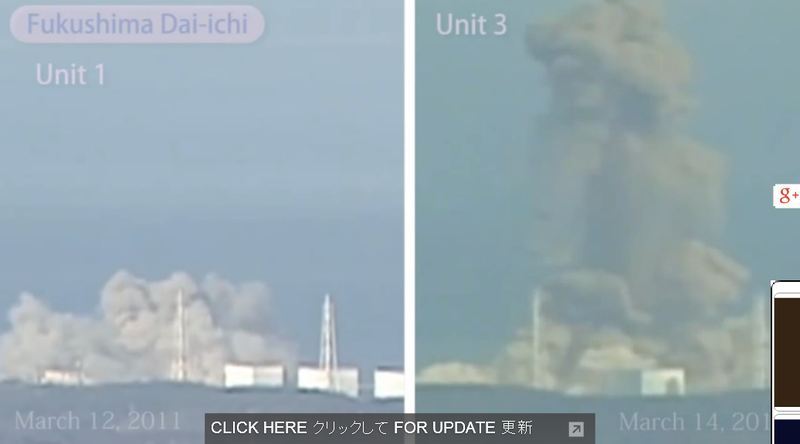 If the frame collapses, triggering fire or explosion inside the spent-fuel pool, the plutonium would pulse powerful neutron bursts that may well possibly ignite distant nuclear power plants, starting with the Fukushima No.2 plant, 10 kilometers to the south….. The upgrade of the Reactor 4 shroud may well have involved the test-fitting of some MOX rods, which abandoned on the floor next to the reactor when the tsunami reached shore. In other words, in early March 2011 crane operators completely filled space inside the spent-fuel pool with new MOX rods and then simply left casks of assemblies on the roof and lowered more into the basement. That is the simplest explanation for the damage to the structural integrity of the reactor building. GE is not about to disclose its role in this disaster………. About bloody time I found real substance. Please, keep providing future data. The world needs to consume the whole truth. The sooner the better.